1 » No. 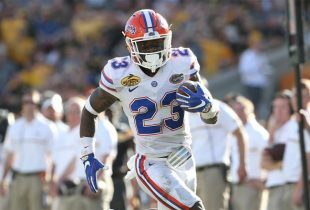 5 Florida Gators baseball (37-14, 15-11 SEC) stalled in a big way on Saturday, getting shut out for the second time this season in a 2-0 loss to the No. 25 Mississippi State Bulldogs (31-19, 13-13 SEC) at McKethan Stadium in Gainesville, FL. A late scratch with a hamstring injury, junior left-hander Brian Johnson was replaced by sophomore right-hander Jonathon Crawford, who did an admirable job as a spot starter. Crawford (4-2, 4 H, 2 ER, 2 BB, HBP, 3 K) gave up single runs in the first and fifth but received no help whatsoever from Florida’s bats in terms of production or run support. The Gators combined to register just three hits on the evening with the first five batters combining to go 0/19 with one walk and three strikeouts. 2 » No. 2 Florida women’s tennis (23-1) registered yet another shutout in the 2012 NCAA Tournament, defeating the No. 31 Washington State Cougars (19-7) and advancing to the round of 16 for the eighth consecutive season. The Gators topped the Cougars 6-0 (shutouts are normally end at 4-0 but three matches finished simultaneously) and combined to go 76-23 in individual games in the seven matches that were completed. The No. 1 pairing of junior Allie Will and sophomore Sofie Oyen registered an 8-1 victory, while the No. 22 duo of junior Lauren Embree and senior Joanna Mather won 8-2 to clinch the doubles point. No. 1 Will (6-3, 6-1), No. 9 Embree (6-2, 6-3), No. 21 Mather (6-3, 6-2), No. 61 Oyen (6-4, 6-0) and No. 79 sophomore Alex Cercone (6-0, 6-2) all won their singles matches as well. UF will take on Michigan on Thursday at 7 p.m. for the opportunity to advance to the quarterfinals. 3 » No. 12 Florida men’s tennis (15-9) began competing in their version of the 2012 NCAA Tournament on Saturday and started as hot as their female counterparts did with a 4-0 sweep of the Navy Midshipmen (18-9). The Gators won the doubles point (8-4; 8-3) and were led by their ranked players in singles action. No. 42 junior Bob van Overbeek (6-1, 6-0), No. 53 senior Nassim Slilam (6-0, 6-0) and sophomore Florent Diep (6-0, 6-0) were victorious in their individual matches as No. 48 junior Tripper Carleton and No. 66 sophomore Spencer Newman also lead at the time the contest was stopped. Florida will face Harvard in second-round action on Sunday for the chance to move on to the round of 16. [EXPAND Click to expand and read three more *pro* BITS after the break. ]4 » A high school student in Independence, OH needed a prom date after the one she was scheduled to go with bailed at the last minute. Her response? Tweet Cleveland Browns cornerback Joe Haden to see if he will accompany her to one of the biggest events in her young life. To Joyce Grendel’s surprise, Haden accepted her invitation and picked her up Friday afternoon in a white Lamborghini to give her a night that she will undobutedly never forget. Haden told FOX 8 in Cleveland, OH that he never attended his senior prom (because he enrolled early at UF) and was just as nervous as his date. “I [was] nervous, too,” he said. “We were taking pictures with me and her family. I feel this is very legit, like I was getting ready, ‘Does this look cool?’ when I’m getting ready. I feel like I’m very legit. This is my prom, too.” This is not the first time Haden has gone above and beyond to put a smile on the face of one of his fans, which begs just one question: How totally awesome is Joe Haden? Joe Haden is just that awesome. I always hear about how fan-friendly he is, and how he loves cleveland (and of course the gators) for helping him succeed. Wish more celebrities and sports figures were like him. Joe is all class. Very refreshing to see a professional athlete go out of his way for someone.